Powder coating, the application of dry paint to a part, is one of the newest techniques in the surface finishing industry. Powder coating offers superior adhesion and coverage when compared to other coating techniques, and it requires skill and proficiency. When you work with Rhinehart Finishing, the industry-leading powder coating company, you’re sure to obtain the best overall coating available in today’s marketplace. We stand apart from other powder coating companies because of the depth of our experience as well as our unique status as an approved applicator of combat-grade powder coat. 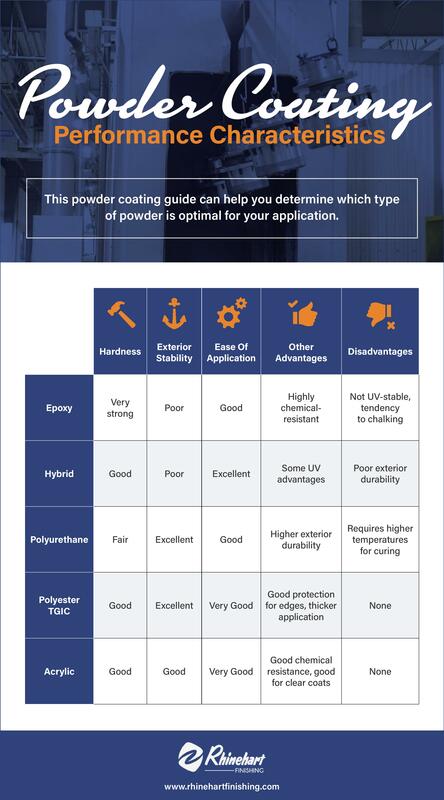 This speaks to our status as an expert in the field, capable of applying coatings that can withstand the harshest and most demanding conditions. Our experience with industrial coating services makes Rhinehart Finishing your go-to source for whatever you and your operation may need. Choosing Rhinehart Finishing for your industrial powder coating needs means you’ll benefit from our wealth of experience and knowledge. Our state-of-the-art powder coating booth is equipped with both manual and automatic guns to ensure that your product receives the optimal industrial powder coating. Our product window size of 12' x 3' x 6' is one of the largest in the Midwest. Most powder coat facilities use iron phosphate for pretreatment, but the Rhinehart Finishing powder coating specialists utilize a military-approved zinc phosphate system — resulting in higher corrosion resistance and enhanced adhesion properties. We are among the few powder coating companies in the U.S. that are certified as a TACOM-approved combat-grade powder coat applicator. We earned this distinction in 2003 through repeat testing, disciplined control and excellent field performance results — as well as our expertise with advanced chemical-resistant powder coatings. One of the most advanced industrial coatings available, our Chemical Agent Resistant Coating (CARC) powder coating not only offers the same superior protection against corrosion and other damage, but it also prevents the absorption of chemical agents. This allows for easier decontamination of equipment. Zero VOCs (volatile organic compounds). Our CARC product produces relatively low emissions, making it safer than other similar products for use around people. Ninety-five percent recyclable. Rhinehart Finishing’s CARC also is better for the environment than other products of a similar nature, because the majority of it can be recycled. This means preservation of resources and fewer chemicals to risk being introduced into the environment. Higher film builds possible. Because our CARC product can be used to create higher film builds, that means more applications are possible and a stronger overall coating for better protection and lower maintenance. Excellent abrasion/chemical resistance. When parts are coated with CARC from Rhinehart Finishing, they can stand up to heavy use and harsh chemicals more successfully, preventing them from wearing down prematurely and preserving them for as long as possible. Resistant to chipping and scratching. Powder coating with CARC makes parts and components highly resistant to damage such as chipping and scratching, which means those parts can remain in service for longer than if they were left exposed. Enhanced corrosion protection. Our CARC products offer much stronger protection from corrosion than similar products, keeping equipment in the field longer and extending its lifespan compared to other types of coatings. Looking for powder coating services? Contact us or request a quote today.